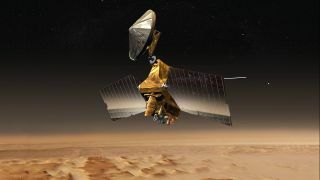 An artist's illustration of NASA's Mars Reconnaissance Orbiter at the Red Planet. A long-lived NASA Mars orbiter appears to be bouncing back from a glitch that halted its science work nearly two weeks ago. NASA's Mars Reconnaissance Orbiter (MRO) put itself into a precautionary "safe mode" on Feb. 15 after measuring abnormally low voltage in its paired nickel-hydrogen batteries, which keep the solar-powered spacecraft running when it's cruising through Mars' shadow. Mission team members brought MRO out of safe mode on Friday (Feb. 23), NASA officials said. The orbiter seems to be in good health overall; the battery voltage is back to normal, MRO is communicating with Earth, and temperatures and power levels are stable, agency officials said. But MRO's handlers haven't put the orbiter back to work yet. "We're in the diagnostic stage, to better understand the behavior of the batteries and ways to give ourselves more options for managing them in the future," MRO project manager Dan Johnston, of NASA's Jet Propulsion Laboratory in Pasadena, California, said in a statement. "We will restore MRO's service as a relay for other missions as soon as we can do so with confidence in spacecraft safety — likely in about one week. After that, we will resume science observations." The $720 million MRO mission launched in August 2005 and arrived at the Red Planet in March 2006. Over the past dozen years, the orbiter has performed a variety of tasks, from hunting for signs of past water activity to scouting out locations for future Mars missions to relaying data from landed craft such as NASA's Opportunity and Curiosity rovers. To date, MRO has beamed home about 317 terabits of data — more than all other interplanetary missions combined, NASA officials said.